During the First World War the front line between the Italian and Austro-Hungarian forces ran through the Dolomites. 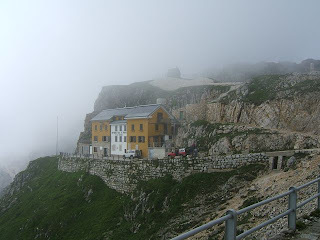 Monte Pasubio was a crucial stronghold for the Italians. They had to hold the mountain, but their supply lines to the mountain were being shelled and were subject to avalanches [on one day, the 13th December 1916, known as 'White Friday', 10,000 soldiers were killed by avalanches in the Dolomites]. 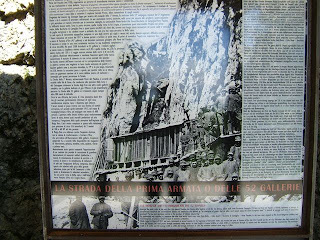 The answer to the Italian Army's problems was the Strada delle 52 Gallerie. 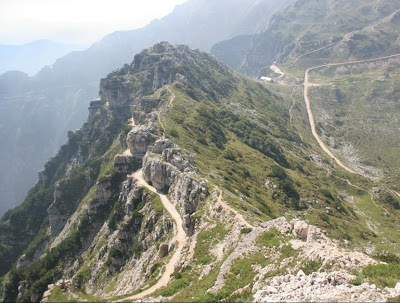 The Strada delle Gallerie [Road of Tunnels] is a mountain path cut into Monte Pasubio in the Dolomites in Italy. 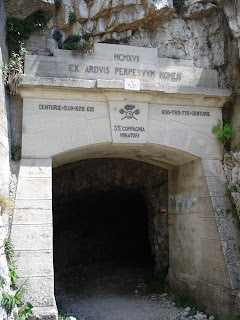 It was built in 1916 by Italian mountain troops and teams of miners. The Strada was started in March 1917 and finished by the end of the year. 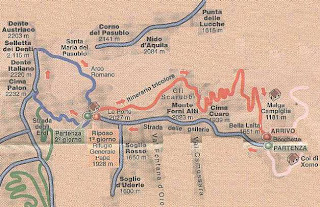 There are many military paths in the Dolomites. What makes the Strada unusual is that it runs through 52 tunnels with a total length of 2,300m. 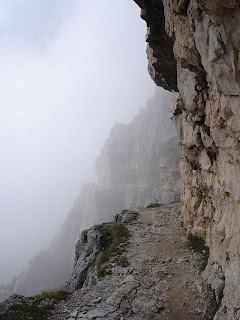 A further 4,000m of path is cut into the side of Monte Pasubio. 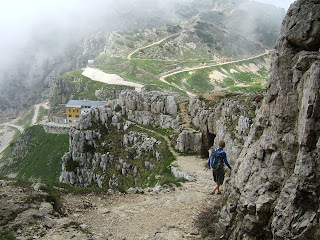 It is one of the best high level paths in the Dolomites and walking it is a memorable experience. We stayed in the pleasant town of Rovereto. 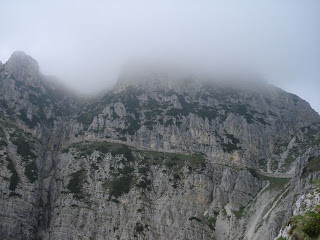 Next morning we drove along the SP46 from Rovereto towards Valli del Pasubio. About three quarters of the way along we turned onto a road running north to the start of the walk at Bocchetta Campiglia. 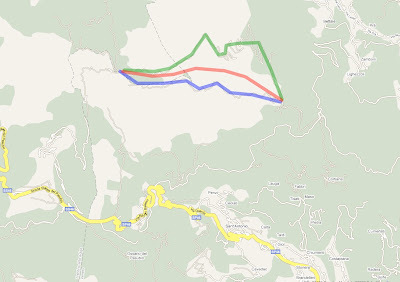 The track from the SP46 to Bocchetta Campiglia is narrow with few passing places. We didn’t meet any traffic coming down the track and were very grateful for that. The local commune need to get out their box of gelignite and blast some more passing places [they could also straighten out some of the worse bends]. During the summer months it may be necessary to pause and buy a parking voucher on your way up the track. There are two car parks at Bocchetta Campiglia. The Strada delle 52 Gallerie starts from the first car park. After your walk you have to drive back the same way you came. The walk starts at a car park at Bocchetta Campiglia [1216m] and ends at an Italian Alpine Club refuge called A Papa [1928m]. There is an information board at the start of the walk, with a small section in English. Each tunnel is numbered and at intervals there are more boards giving information on the next few tunnels. Looking back to the start of the path. The car park is just visible in the centre of the picture. 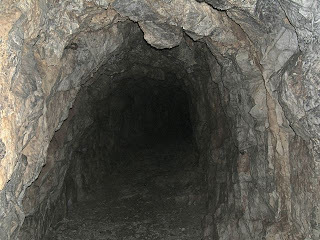 The tunnels vary considerably in length. The longest one is over 300m long. There are a few short ones but many in the 40-90m range. A good torch [plus a spare and batteries is essential]. There are long stretches of tunnel where it is pitch black. You will not need a helmet. I am almost 6ft and managed with a bit of stooping. You will be ascending [sometimes steeply] pretty much all the time. Only the last two tunnels slope down. In some of the tunnels the path is smooth. In others it is very uneven. Water drips down from some tunnel roofs and makes the path slippery. As you get higher there are splendid views of the valley. About two thirds of the way along there is a long open stretch where the path is cut into the side of the mountain. By the time we got past tunnel 40 we were in cloud. 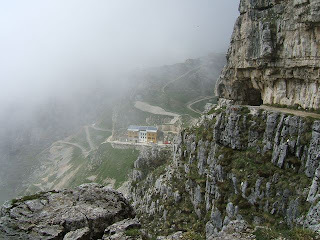 At the end of the Strada you arrive at Refuge A Papa where you can eat and drink. I think they also offer accommodation. There appeared to be a path continuing beyond Refuge Papa. 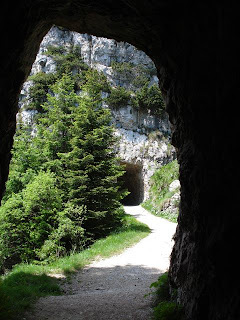 It looked as if it was cut into the side of the mountain in the same way as parts of the Strada, but without any tunnels. My map seems to indicate that this path is part of what is called "The Road of Heroes". There are three paths between the car park at Bocchetta Campiglia and Refuge A Papa. Path 370 [green on the map]. This is a long open path that runs on the other side of the ridge from the Strada. 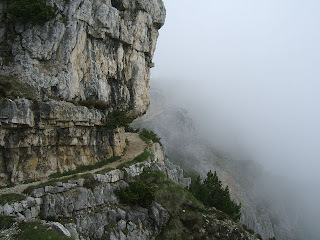 The Strada runs on the south side of the ridge, the via ferrata along the ridge and 370 on the north side of the ridge. This photograph [not mine] shows the three paths. We went up by the Strada and came down by 370. 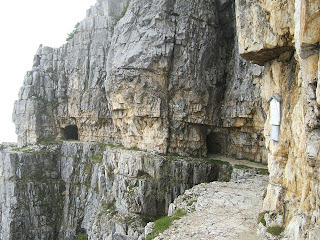 More hearty types might go up by the via ferrata and back by the Strada. I don’t think descending through the tunnels is a good idea. 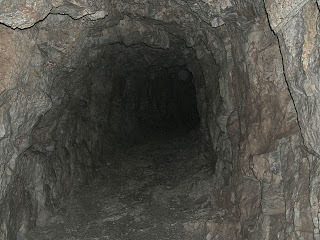 In some of the tunnels it is very steep and rough underfoot. The rock is also wet and descending offers numerous opportunities to acquire multiple contusions. If you plan to descend through the tunnels a walking pole would be handy to help you keep your balance [and a foam rubber suit]. 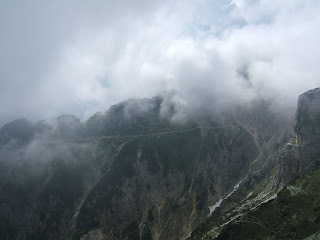 The above photograph shows Path 370. 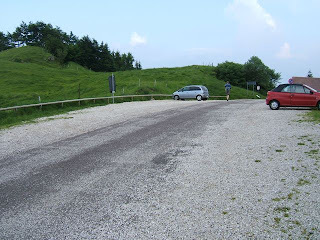 One of the car parks at Bocchetta Campiglia. 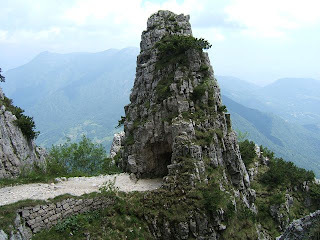 The relevant map is Kompass’s 1:50,000 101 [Roverto – Monte Pasubio]. The map was handy for finding the turn-off from the main road. It was not needed after that. 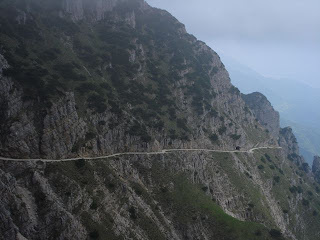 See this page for an excellent illustrated guide to the via ferrata Sentiero Gaetano Falcipieri that runs alongside the Strada. Another guide can be found in Via Ferratas of the Italian Dolomites: Volume 2 by Fletcher and Smith. Published in 2003 by Cicerone [UK]. 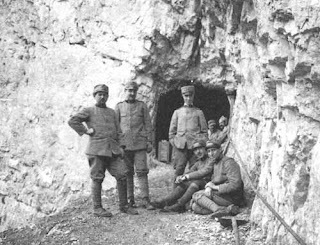 Video of WW1 Italian soldiers in the Dolomites. A nice video [not mine] of a walk up the Strada. 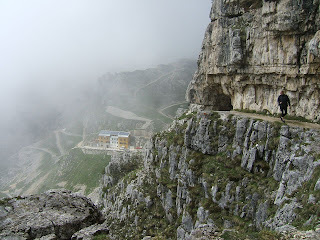 The Strada is supposed to be a classic mountain bike ride. The authorities have erected barriers at either end to stop bikers but it would be possible to pass bikes over the barriers. 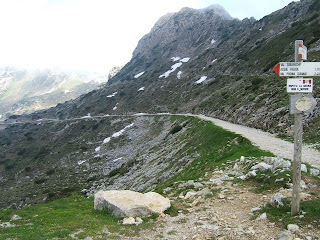 However, I think someone would have to be very silly to do the Strada as a mountain bike ride. It would be too dangerous and too much hard work for little benefit. 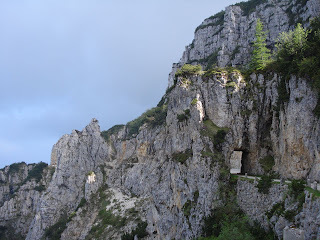 The journey between Rovereto and the car park at Bocchetta Campiglia took about 1 hour each way. 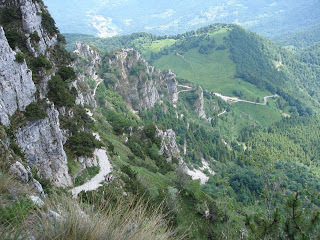 It took us 3.5 hours to ascend the Strada and almost 2 hours to descend path 370. A sign at Refuge Papa states that it is only 2km along 370 to the car park. Don’t believe it. 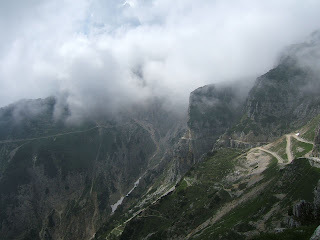 The Bocchetta Campiglia carpark is 19.09 kilometres [11.86 miles] south east of Rovereto at Latitude 45 degrees 46 minutes and 43.07 seconds. Longitude 11 degrees 13 minutes 40.81 seconds. 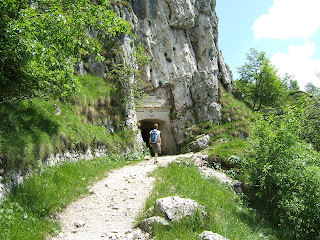 I have written about other WW1 sites in the Dolomites in my posts on Via Ferrata Lagazuoi Tunnels and Monte Piana. The Strada is on a far grander scale than either of those. It has been described as ‘a marvel of military engineering’ and that ‘no other work equals it along the entire European front’. Because of its history [it played an important part in a key battle] and because it is so exceptional I think UNESCO might consider the path for World Heritage status. After all, so little remains of this terrible conflict. There are a few trench systems, the forts at Verdun and the cemeteries in France. We should have at least one relic of WWI on the World Heritage list. You can read more about the war in the Dolomites in Mark Thompson's The White War: Life and Death on the Italian Front, 1915-1919. (Faber and Faber, 2008). Have you walked the Strada? Leave a comment below to describe your experiences. 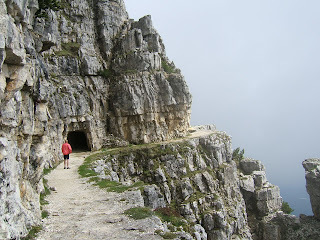 For more posts on the Dolomites, other walks or my blogger's selections click on the tags on the right.